Managers responsible for critical IT loads or other high demand applications want to make sure that their equipment is protected by the most reliable, efficient technology possible. This is especially true when it comes to UPS battery back-up technology. There has been great interest recently in Lithium-Ion battery technology and the UPS Lithium-Ion Battery market is rapidly expanding. Toshiba launched their own battery technology called SCiB (Super Charge Ion Battery) back in 2008. While this technology has been available for many years, it’s introduction into the UPS system has been fairly recent. The newest iteration of this battery is showcased in the Toshiba G9000 series UPS unit. We will discuss the make-up of the SCiB and also some of it’s main advantages compared to similar battery technologies. A Toshiba SCiB battery cell. SCiB batteries have a high level of safety. The SCiB uses oxide-based materials that are specifically designed to prevent thermal runaway situations. SCiBs are often used for applications requiring high safety and reliability, such as automobiles and industrial equipment. SCiBs can perform well in both very high and very low temperatures. It will perform in temperature ranges as low as -22 Fahrenheit, and as high as 131 Fahrenheit. They work well for many applications exposed to low temperatures, such as outdoor equipment. SCiBs can charge very rapidly. Typical charge times range between 6-10 minutes. Rapid charging also typically does not degrade battery performance. SCiBs have a long life cycle. Lithium-Ion battery life cycles often exceed 20,000 charge and discharge cycles. This is over 20 times greater than a VRLA battery’s lifetime. SCiBs also require little maintenance, even when used in applications that perform frequent charging an discharging. SCiBs are light! Typical cells are half the weight and volume of VRLA batteries. SCIBs have a high input/output. This means they are chargeable using a large current and provide a large current output. They can accept a large amount of regenerative energy in a short time, such as when you apply the brakes in a vehicle. SCiBs have a large available capacity, or State of Charge range. This range make it possible companies using them to reduce the battery capacity or number of batteries needed for a system. Toshiba showcases their latest SCiB batteries in their G9000 series energy storage UPS units, which are now available at QPS! These units have a 10 year battery warranty and lower Total Cost of Ownership than either pure lead or VRLA batteries. The unit also has built-in cell-level monitoring, so managers can detect if a battery in a pack is going bad, and replace the battery before it causes further damage to other batteries in the unit. The unit performs very well in data center and IT environments. Read more about the Toshiba G9000 unit here. If you want to be sure the Toshiba G9000 UPS unit is right for you, or would like to learn more about SCiBs in general, contact QPS today. 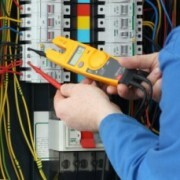 Our power quality experts will help you evaluate options that are the best fit for your environment. QPS Announces New Lithium-Ion Line of UPS Systems External Maintenance Bypass – What Is It and When Is It Necessary?